We are using the WRONG METHOD to achieve NYSC’s objectives. Think about this before you read on- Is it OK to force you to be friends with me? I’m not against NYSC, I’m against the fact that it is a MANDATORY service and is run by government. To achieve NYSC’s fine objectives, it should be VOLUNTARY and run NOT by government. Why? Because you can’t force friendship and government doesn’t know how to run things well. Friendship is good but forcing it makes the friendship either not achievable or less achievable. NYSC’s main objective is to unify the nation after the civil war, a very good objective but we are using the wrong method to achieve it. The government mandates every graduate of higher institution to serve otherwise she/he will not be employed in the formal sector. 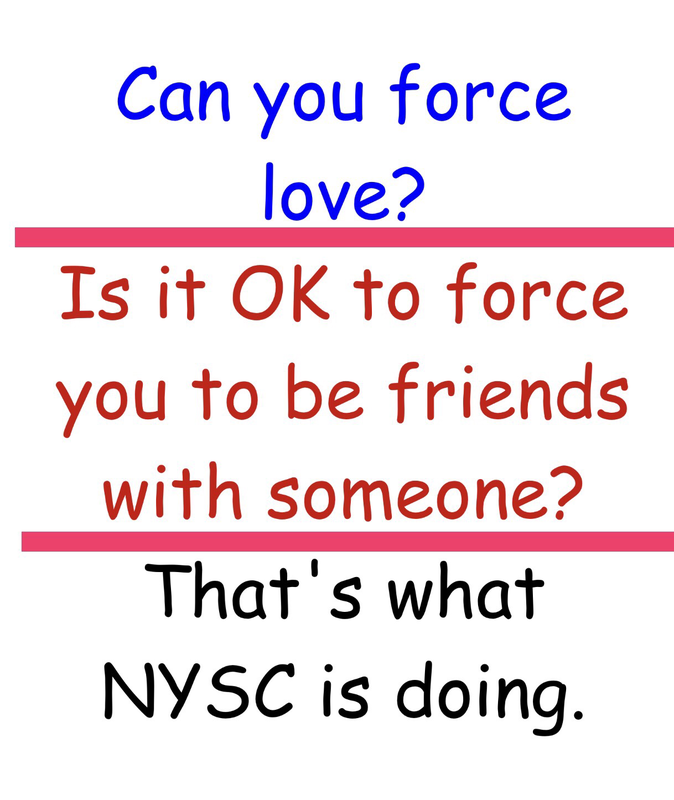 This method is bad because it is forcing you to go through NYSC whether you like it or not. Again, is it OK to force you to be friends with me? ← Should NYSC be scrapped?